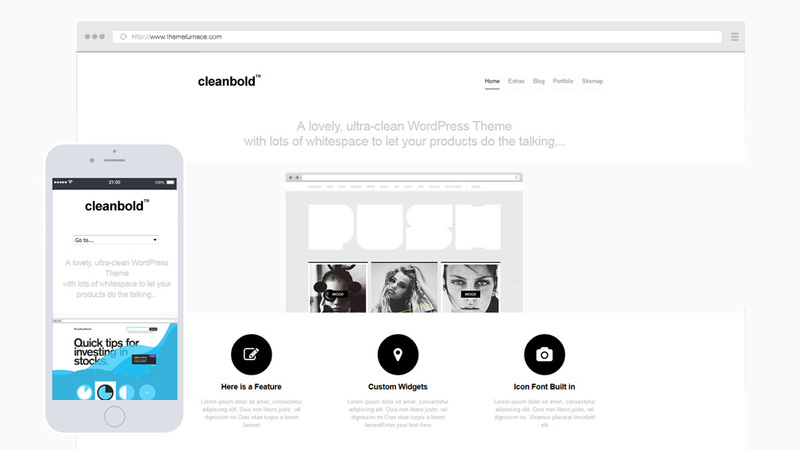 CleanBold is ultra-clean and simple portfolio WordPress theme which was designed with businesses and designers in mind. Using lots of whitespace and simple but bold typography its a great theme for letting your products work stand out. The main focus is the portfolio area which lets you show off your designs, products, art or photography in style. We continuously test our themes so you will know they are always compatible with the latest version of WordPress. We have written detailed documentation which guides you through the process of using your new theme. We have customer support forums and a ticketing system should you ever need any help with your theme. All our themes are responsive so they look great no matter what size screen you are viewing them on. We include just the right amount of useful widget areas and sidebars so you can place your content. We include FontAwesome Icons & Hundreds of Google Fonts to Choose from to customize your site. We include our own widgets for Social Media, Displaying Advertising and showing off your Flickr & Dribbbble images.